The bullion server developed has been ranked as the world’s fastest X86 enterprise-class server, according to the international SPECint®_rate2006 benchmark with the bullion server achieving a peak performance of 4,110 according to the SPECint®2006 benchmark the fastest competitive system only managed a performance of 2,180.
bullion provides up to three times better energy efficiency compared to the previous server generation thanks to a variety of innovative technologies these innovations start at the CPU core level, and involve many system components including chipset, fans and power supplies. In addition the Bull System Manager (BSM) provides cross-node active energy management for all bullion systems within a Datacenter. 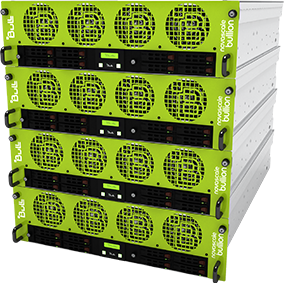 Power Consumption can now be monitored and managed from a global Datacenter perspective down to the CPU core of a bullion server – helping administrators balance application service levels and energy consumption in accordance with their Datacenter power budget. With bullion customers have the choice between different CPU options – ranging from performance-optimized top slews to energy- optimized low power processors. When deciding for a medium or low power CPU the bullion server can optionally be equipped with smaller power supplies. With this type of ‘right- sizing’ as a function of workload and SLA goals the energy footprint reduction can reach 40% right from the start– compared to the usual ‘one size. Our professional workload and energy sizing services are at hand in order to analyze and help choose the most suitable option. Every Watt which is saved on this level is a double win as it will not require additional energy on the Datacenter cooling and the power budget side. At the lowest level power management is implemented through frequency and voltage scaling at the processor level. The Nehalem EX processor provides up to ten Power states (P-states) which allow the CPU frequency to fluctuate, thus dynamically adjusting the energy consumption of a novascale bullion server. Looking only at the CPU consumption does not provide the whole picture. The P-states can't control the power consumed by the server as the CPU has no mechanisms to measure the power it consumes. This mechanism is implemented by firmware running in the Intel® Xeon® chipset.